or find at bottom more itineraries from "Progetto Giubileo". Santa Croce is a Florentine Gothic church with frescoes by Giotto and Gaddi, sculptures by Donatello and a beautiful courtyard. To continue the Renaissance theme you can visit Brunelleschi's Pazzi Chapel, a small masterpiece of classical proportions. Considered Florence's most important square, a short walk through the Piazza della Signoria is definitely advisable. From there you can walk through the Uffizi Museum arches and continue to the banks of the Arno River with a breathtaking view of the Ponte Vecchio; an amazing old bridge, with plenty of established Florentine jewelers. Visit Santa Croce square, and walk to the Palazzo Medici Riccardi. Have a look at the Michelozzo palace built for Cosimo dé Medici, which set the tone for all Renaissance palaces. Visit the courtyard and view Gozzoli's frescoes in the Cappella dei Magi, not forgetting the outside of the building visible from the narrow streets. Visit the historical laboratories of Florence, to see how the same arts of the Renaissance are still practiced today: ceramics, mosaics, leather and perfume. This is a square rich with delights, whether it be the Baptistery, with Ghiberti's doors that Michelangelo said were beautiful enough to be the gates of Paradise or Giotto's "campanile" or bell tower. Brunelleschi's enormous dome of the cathedral can either be admired from the ground, from the bell tower or by ascending the 460 steps to the top for a panorama of the city: not for the faint-hearted! 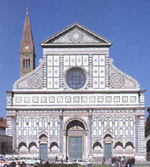 San Lorenzo is one of two churches in Florence by Brunelleschi. He adopted a simple geometry to develop complex spatial patterns, which can be seen inside the church as well as in the old and new Sacristies; designed by Brunelleschi and Michelangelo respectively. This is a chance to compare masterpieces from the early and high Renaissance. The church has one more treasure: Michelangelo's Laurentian Library, located in the adjacent cloister, which is famous for its entry vestibule, where Michelangelo inserted a stairway that seems to float down from the second floor reading room. If you have enough time you can go to Santa Maria Novella, a Gothic church with a Renaissance facade added by Alberti in the 15th century. In the church you can see paintings by Giotto, Masaccio and Uccello. Piazza della Santissima Annunziata is one of the Renaissance's first piazzas, with its symmetrical buildings and trapezoidal shape. It isn't possible to the square without noticing the buildings; Brunelleschi's Ospedale degli Innocenti with its elegant loggia, and Michelozzo's Church of the Santissima Annunziata, where you'll find Andrea del Castagno and Pontormo paintings. Go to one of Florence's less famous treasures: the Museum of San Marco. Fra Angelico lived in this monastery, and he painted a small devotional fresco in each of the monks' small bedrooms, creating a truly unique museum experience. You can continue to San Apollonia, to see Andrea del Castagno's "Last Supper" fresco. The medieval Palazzo del Bargello now houses the Bargello museum, where you can enjoy the building's interior spaces and the sculptures by Donatello, Michelangelo, Brunelleschi and Ghiberti. Another palace to consider is the Palazzo Gondi, where you can admire how the Florentine palazzo evolved from the Middle Ages to the Renaissance. There's also the medieval Palazzo Vecchio, Palazzo Davanzati and Alberti's mid-14th century Palazzo Rucellai, described as the most eloquent example of the Renaissance's love of proportion and order. There are many important churches to be seen in Florence, here are just a few from the Middle Ages onwards; the Romanesque 11th-century Santissimi Apostoli, the 13th-century Santa Trinità and Brunelleschi's early Renaissance masterpiece, Santo Spirito. Have a look at Santa Felicita, where you can see Pontormo's Mannerist frescoes of the Deposition and the Annunciation. Finish with Santa Maria del Carmine, where you can visit the Brancacci Chapel and see Masaccio's frescoes, especially the "Banishment of Adam and Eve from Paradise." MORE ITINERARIES FROM "PROGETTO GIUBILEO"